Commit to doing good rather than making good as lawyers. I originally found the video through the website Bring Omar Khadr Back to Canada, a site bringing a number of human rights groups together in an effort to have Khadr repatriated to Canada. Their “call to action” leads to the Amnesty International Canada webpage No Security Without Human Rights. Action by the Lawyers Rights Watch Canada is traced on their Campaign Page for Omar Khadr. Previous posts on Slaw.ca about Omar Khadr are here. 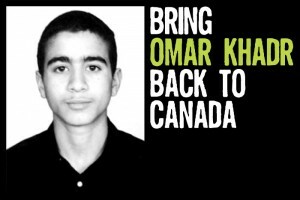 If there is any such thing as humanity left, then Omar Kadr should not ONLY be released and returned to Canada BUT he should be given a chance to rehabilitate and reintegrate. Khadr absolutely SHOULD be returned to Canada. But he has to be handled carefully upon his return. One has to remember that Khadr was indoctrinated into Islamic militant ideology. If he won’t renounce that philosophy so that he even can be rehabilitated, then he should be stripped of his citizenship and deported along with the rest of his family (most of whom should have been deported long ago). As a Canadian citizen, Khadr deserves the opportunity to be handled justly. But he is not owed the opportunity to be unconditionally set loose where he may well be dangerous. We don’t have to like it, but we do have to be realistic about this.